Psychic Dinner Dates: Go to our Calendar of Events link on our Restaurant page for more detailed information. Advance reservations highly recommended ! Go to our “Packages” page and get the details for our specials and check out our suggested activities below ! Catskill Fling Hotel Special – Stay 2 nights and receive a restaurant dining coupon worth $25. Hiking in the Catskills – Bring your boots or hiking shoes ! Whether a novice or experienced hiker, many trails and walks exist nearby. The inn makes a fabulous spot to come home to after your day in our mountains. The Kaaterskill Clove Experience – Awaken to adventure! Explore historic and scenic stops throughout Greene County, including Kaaterskill Falls, Pratt Rock and the Thomas Cole National Historic Site. Hudson Valley School of Art Trail – an interesting driving tour to see where historic works of art were originally created and how it looks today. Go to the “Restaurant Page” and click on Calendar of Events. For the most personal of service, call us direct at 518-622-3261. This is where hospitality and tradition combine with history. Please take a few moments to read about us and how we fit into your getaway …. We offer over 150 years of hospitality experience. The current owner’s family history of owning this hotel started in 1931. You will note a certain European atmosphere along with it’s Catskill Mountain essence. 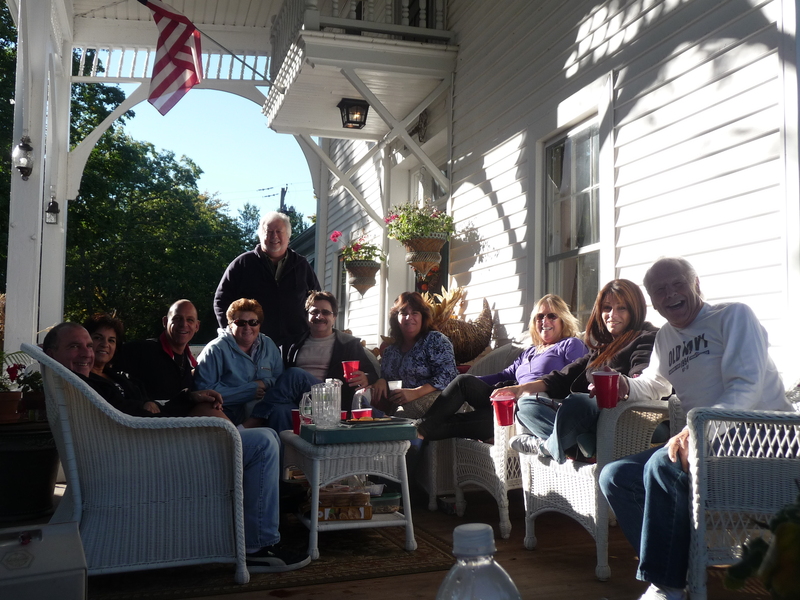 Stan and Suzanne are 3rd generation family innkeepers keeping tradition alive. Suzanne’s grandparents and parents are from Bavaria, Germany and the Inn has been in her family over 80 years. Stan was born in Poland. They met while Stan was working here during a summer hiatus from cooking on ships! The restaurant they started is a C.I.A. and California Culinary approved extern teaching kitchen. For more history, click on the “About Us” page. There are 18 bedrooms, a cocktail lounge and a full service restaurant on it’s 100 acres. All rooms feature private bath, cable tv, free wi-fi, a/c, in-room coffee, alarm clocks (if you really have to), all but the “cozy/charming” category have mini-fridges, some have jetted bathtubs and fireplaces. Each staff member is carefully hired and encouraged to make each guest comfortable. The hearty full menu made-to-order country breakfast that’s served at your private table is the perfect way to start each day. The rooms – are lovely and comfortable. You and your pets can enjoy them together, each one being tastefully decorated and complemented with modern amenities. The restaurant – is sought out for it’s new award-winning cuisine in an old world atmosphere. Open Thursday through Sunday, it makes for a great weekend destination! Committed to the environment – Guests wouldn’t know it, but this 19th century country inn fitted solar hot water panels onto their building! You can also check out the 52Kw solar panel array in the lower field. Come and enjoy the relaxed friendly hospitality that is The Bavarian Manor Country Inn. The people you will meet, the accommodations and the food styles are all relaxed and a bit laid back. Don’t be afraid to smile and nod hello. We offer country friendliness but temper it with a good dose of respectful privacy. There is a sign someone gave us. It says “Stress Free Zone”. Can you relate? We hope to sway those opinions that feel that newer is best. Our mission, as stated over 145 years ago, has been to offer guests “a calm oasis from a stressful world in a friendly and gracious manner.” We’ve been around too long to be pretentious. Of course, with guests records that go back to 1865, the building has some history to it. Some of the walls are crooked, some of the floors are slanted and sometimes the building creaks. So just how does that explain why the Bavarian Manor Country Inn is so popular? The answer to that is simple…. The Bavarian Manor Country Inn has a great sense of place. Washington Irving called the Catskill Mountains a “spell-bound region”. When you arrive, you feel it. This historic Victorian country hotel has been a Catskill Mountain landmark since 1865. 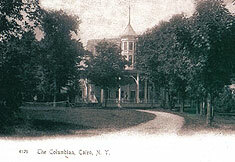 Starting out as a family farm turned boarding house, then mineral water health spa and becoming “The Columbian” and then in the early 1930’s, it was purchased by the current owner’s grandparents and renamed The Bavarian Manor Country Inn. 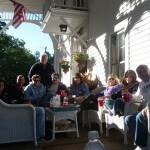 It was once written (in the 1940’s) that the Inn attracts a happy and carefree group. That is true today as well. Come and sit on our lovely porch in all seasons! Enjoy the fresh air, open sky, peace and rest. We like to see our guests come back time and time again and look forward to meeting new guests. To find out exactly where we are located, please go the webpage “About Us” and click on the directions link. Did you know that the history of vacationing in the United States started here? It is the northern region of the Catskill Mountains that first started boarding guests who came to ease their home-sickness for the mountains of their home country. The wealthy came for their health and to take in the natural beauty of the land. Today, the Great Northern Catskill Mountains continue to entice visitors year-round with it’s breathtaking scenery and adventure. People from around the world come here for the hiking, skiing, farm to table dining, exciting festivals, shopping, history, exploring and relaxing. Just like these world travelers, all of this can become part of your visit here! Artists such as Thomas Cole, Asher B. Durand and Frederic Church were captivated with it’s spiritual-like beauty creating the Hudson River School of Art from these very mountains. This is the “Land of Rip Van Winkle”. Check us out on page 295 of The Catskills, It’s History and How It Changed America by Stephen M. Silverman and Raphael D. Silver. 2014 – Bed & Breakfast of Distinction Award ! New York State Hospitality & Tourism Association (NYSTHA) has recognized us as the B&B of Distinction in all of New York.- Thank you! Summer 2013 – FOCUS Magazine – featuring the inn’s committment to solar energy. May 2013 & 2014 – Best Hudson Valley Inn ! One of the Top 3 – As voted by the readers of Capital Region Living Magazine – Thank you! 2012- Best Schnitzel in the Hudson Valley ! As voted by the readers of Hudson Valley Magazine – Thank you ! Through the years, the Inn has been nicely reviewed by national magazines & newspapers for it’s food, value and style….